Urban legends, myths, and distorted truths are commonplace when talking about engine oil. It’s one of those auto maintenance subjects that drivers think they know a lot about, but the myths and distortions drivers actually believe in can be disastrous. Clearing up the air about engine oil can help you make the right decisions for your vehicle, which in turn can help you avoid costly automotive problems later on. That’s why we sat down to write this post, so we could give you straight talk about the engine oil in your car. Fact: There was a time when the 3,000-mile rule was the standard for cars, but advancements in oil chemistry and engine technology have resulted in longer intervals in between oil changes. Although there’s no harm in changing your car’s oil every 3,000 miles if that’s the schedule you’re used to, experts recommend sticking to the designated intervals in the owner’s manual. Fact: Drivers should be in the habit of checking the engine oil regularly, but just because it looks dark or dirty doesn’t necessarily mean you’re overdue for an oil change. If you’re using an oil that contains detergent additives, the oil is actually working just the way it’s supposed to if it looks dirty. Again, this is where the manufacturer-recommended oil change interval can help you decide when to change the oil, regardless of the color on the dipstick. Fact: You may have heard about the benefits of synthetic engine oil, but perhaps you’re hesitant to make the switch or even try out synthetic oil because you’ve always heard that you can’t go back to traditional oil once you put synthetic in your car. We’re glad to tell you this is a straight-up myth. You can use any type of engine oil you prefer, traditional or synthetic, as long as it meets requirements set out in the owner’s manual. Need an oil change? Have questions about engine oil? Either way, the experts at Murray’s Auto Clinics can help. Our auto maintenance and repair shops in Silver Spring, MD are your go-to source for complete auto care, including oil changes and transmission flushes. Call us at (240) 450-2478 to learn more. 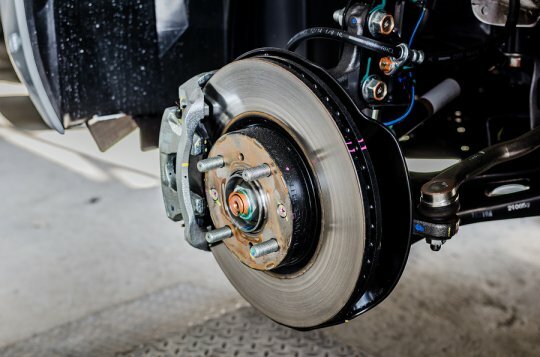 Brake rotors are an important component in your vehicle’s braking system and serve a critical purpose in helping your car slow or come to a sudden stop when you engage the brake pedal. Also called brake discs, rotors are what the brake pads clamp down on to stop the wheels from spinning. If you’ve ever seen a bicycle brake in action, where two rubber pads rub against the wheel rim creating friction which slows the tire, then you can imagine how the rotors and pads work together to stop your vehicle. If you experience any changes in your car’s braking abilities or performance, visit the auto repair experts at Murray’s Auto Clinics. We provide drivers in White Oak, MD and the surrounding areas with expert brake repair and maintenance services . Call us at (240) 450-2478 to schedule an auto repair inspection or stop by one of our two shops for service today. Regardless of your skill level and confidence working under the hood of your car, there’s a time when everyone needs help from a professional auto mechanic. But with so many mechanics to choose from, how do you know which mechanic you can trust with your vehicle? Choosing the wrong mechanic can be very costly, so it’s important that you know how to choose the right one. Regardless of how big or small your auto repair needs are, keep these tips in mind to choose the best auto mechanic in Silver Spring, MD . ASE-certified mechanics and auto repair shops are the best of the best. Since 1972, the National Institute for Automotive Service Excellence (ASE) has worked to improve the quality of vehicle repair and service by testing and certifying automotive professionals. If you see the ASE logo in the window of an automotive, you can trust your vehicle will be in highly capable hands. For major automotive repairs, such as a transmission replacement or total engine overhaul, you might first like to ask for referrals so you can hear what other customers thought of the service they experienced. Even if you don’t contact anyone, an auto repair shop that is willing to offer referrals is a good sign since they are happy to let you speak with actual customers. Once you’ve identified an ASE-certified auto mechanic or repair center near you that has generally good reviews, ask for a written estimate for the work repairs needed. Although the final price can be different from the quoted price, a written estimate is a good sign that the mechanic is reputable and trustworthy. Since 1982, Murray’s Auto Clinics have helped countless drivers solve all sorts of automotive problems, big and small. If you want to leave your vehicle in the hands of a mechanic you can trust, visit any of our auto repair centers around Silver Spring, MD and let our ASE-certified mechanics get to the bottom of whatever automotive issue you’re experiencing. Call us at (240) 450-2478 or contact us online to schedule an appointment or request a free estimate.